PIXLEY – Once thought of as major polluters, Central Valley dairies are now converting the gases released from tons of cow manure into one of the most cost effective and renewable energies, natural gas. And earlier this month, a Tulare County facility became the first ever to pump renewable natural gas from dairies directly into a state utility’s pipeline. On Feb. 14, Southern California Gas Co. (SoCalGas) and biogas producer Calgren Dairy Fuels announced that renewable natural gas produced at Calgren’s dairy digester facility in Pixley, Calif. was being injected into SoCalGas pipelines. The alternative fuel is not only considered carbon neutral, it is carbon-negative because it captures the methane produced by manure before it is released into the atmosphere, a major contributor to global warming, creating an alternative to dirtier forms of fossil fuel, such as diesel. The ethanol-based fuel can then be used in trucks and buses, to generate electricity, fuel heating systems in homes and businesses, and for cooking. Calgren’s facility, known as a dairy digester pipeline cluster, will collect biogas from anaerobic digesters at 12 Tulare County dairies and then removes unwanted chemicals and gases to produce pipeline-quality renewable natural gas. Minter said both traditional natural gas and renewable natural gas (RNG) are produced through anaerobic digestion, where bacteria feed on solid waste and release and produce gases, primarily methane, and, to a lesser extent, carbon dioxide. Instead of waiting for manure to decompose on a glacial timeframe, Minter said the manure is stored in lagoons encapsulated in large structures. By sealing the lagoons, oxygen is removed from the equation and speeds up the digestion process. The gases created at each dairies’ digester are then siphoned off to Calgren’s treatment facility where the methane is cleaned and refined similar to the process for removing carbon dioxide from traditional natural gas. Once the RNG leaves Calgren’s facility, it is then piped directly into SoCalGas’ pipeline for utility and fuel customers. “What used to take millions of years to produce underground is now being constantly created at these facilities,” Minter said. This is the first such dairy digester pipeline cluster in California and is expected to be the largest dairy biogas operation in the U.S. when Calgren adds nine additional dairies later this year. The facility, which came online in 2015, will capture the methane produced from the manure of more than 75,000 cows, preventing about 130,000 tons of greenhouse gas from entering the atmosphere each year, the equivalent of taking more than 25,000 passenger cars off the road for a year. Methane accounts for about 9% of all greenhouse gases in California and car and heavy truck traffic represents about 41% of all emissions, according to the California Air Resources Board. RNG can be produced from dairy manure, food waste, landfills, and wastewater treatment plants and other sources. Capturing this otherwise wasted gas and turning it into a renewable fuel significantly reduces greenhouse gas emissions from these waste sources. With its affiliates, Calgren has been producing renewable fuels in California’s Central Valley since 2008. Its fuel ethanol is among the cleanest available. As a result of its pipeline dairy digester project, Calgren will be able to add renewable compressed natural gas to its slate of products. The company is also constructing a facility to produce biodiesel from waste feed stocks without the use of chemical catalysts. Research shows that California can achieve the same greenhouse gas emissions reductions as electrifying 100 percent of the state’s buildings by displacing 16 to 20 percent of traditional natural gas with renewable natural gas sourced from dairies, landfills and wastewater treatment plants. This scenario is two to three times more cost-effective than mandated electrification and does not require expensive appliance change outs or impose limitations on the forms of energy Californians can choose. SoCalGas will be capable of adding up to 2.26 billion cubic feet of renewable natural gas each year to its pipeline system from the facility, enough to fuel more than 1,200 Class 8 heavy duty trucks. Renewable natural gas has already begun to clean the air and reduce greenhouse gas emissions in California’s transportation sector, which accounts for more than 80 percent of smog forming emissions and about 40 percent of greenhouse gas emissions in the state. The latest generation of natural gas engines for heavy duty vehicles can reduce smog-forming emissions by more than 90 percent. When fueled with renewable natural gas, they can reduce greenhouse gas emissions by 80 percent or more. Already, more than 60 percent of natural gas trucks in California are fueled by RNG delivered by SoCalGas pipelines. Landfills and dairies make up the vast majority of methane emissions in California. SoCalGas’ Minter said about half of the methane release from a dairy is from manure and the other half is from cow flatulence. The Calgren project and others like it are partly funded under California’s Dairy Digester Research and Development Program, which aims to reduce greenhouse gas emissions from manure generated at state dairy farms. Calgren’s preference is to provide renewable fuel for existing CNG refuelers in California via SoCalGas’ pipeline system. 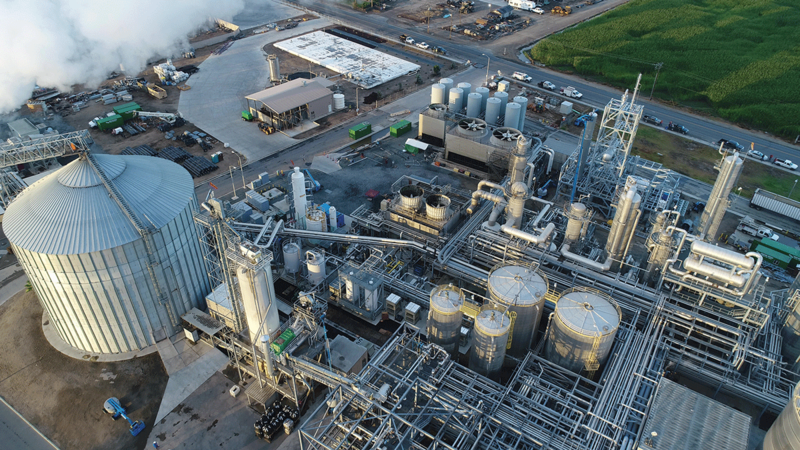 However, the Calgren facility is also able to use the renewable gas to indirectly produce a high-octane gasoline additive or in a new biodiesel plant that will come online midyear. About 90% of SoCalGas’ 21.8 million customers use natural gas for heating, hot water, cooking, drying clothes or other uses. Natural gas delivered through the company’s pipelines also plays a key role in providing electricity to even more Californians as about 60 percent of electric power generation comes from gas-fired power plants. “Developing renewable natural gas is a smart and cost-effective solution to reducing greenhouse gas emissions from the transportation and building sectors,” said Sharon Tomkins SoCalGas vice president for customer solutions and strategy. Consumer preference polls support the increased production and use of RNG. Research shows nine out of 10 California families use natural gas in their homes and prefer it by a margin of 4 to 1 over electricity. In addition, strong majorities of consumers—nearly 80 percent—prefer to use natural gas for cooking in their homes, and nearly two-thirds of consumers believe gas is their most affordable energy choice. According to the American Gas Association (AGA), households that use natural gas for water and space heating, cooking and clothes drying save an average of $874 per year compared to homes using electricity for those applications. In addition, unlike solar and wind energy, renewable natural gas is available when needed—day or night—for use in homes or electric generation. For more information on renewable natural gas, go to: socalgas.com/smart-energy.